This will work to rebuild missing iTunes playlists in Mac OS X and Windows. The reason we are ensuring these files are on the desktop is to have a backup in the odd case that the rebuild doesn’t work. You’ll notice after you have reimported the playlists that the ‘iTunes Music Library.xml’ file will be rebuilt in your iTunes Music directory, once everything is functioning you can safely delete those files from the desktop. I’m not really sure why the iTunes playlists disappear during some transfers and updates, but it seems to happen randomly. The last time I ran into this I was moving iTunes music from a PC to a new Mac which worked wonderfully until I discovered none of the playlists were there. Just moving the file and then reimporting it did the trick though. ahh this happened to me a few months ago and I didn’t know what to do so I remade them by hand, damn! What a pity! The next time you can use some tools to restore the iTunes library. Such as Wondershare and FonePaw iOS Transfer. They can easily to backup and transfer files between iOS devices and computer. You can also backup to iTunes without iTunes. It sounds unnecessary, but if you are bored of iTunes and iCloud, you will understand. Thanks for the info! It was very helpful this morning. Does anyone know how long is process takes, as mine still says importing “itunes Music Library’ and its been around an hour now.. i did have around 100 playlist and 7000 songs. Just as i asked that it started repopulating but still no songs in my playlist’s, just duplicated all the playlist with nothing in them! Kieren, I encountered the exact same thing. The names of all my playlists are there but the song contents are missing. Please help i tried the steps above but nothing is working !!! scroll your mouse over PLAYLISTS on the left sidebar. Show or Hide will come up to the left of the word PLAYLISTS. Click on Show or Hide and your PLAYLISTS will Show or Hide. Simple but it happened to me on a PC for no raisin. Mine were just hidden, thanks for posting this. Unfortunately I did the steps above before reading your post and now I have duplicates of all my playlists… better than none! This worked for me too! Thanks so much for telling us! lurice0, MANY thanks for posting this tip. I was sure that my daughter’s cat had deleted my playlists — I had no idea the Show/Hide control even existed! Two hours of panic, followed by sweet relief. I did the above at first with no result because prior to finding this gem, I lost my files and then clicked the find my media button. Big mistake – as that changed iTunes Music Library file and included everything on my computer (lots of stuff with no playlsts). GOOD NEWS! I found another way to salvage the files via one further step. I located the last decent looking .tmp file that was made a few days prior automatically in iTunes during a music purchase…and renamed it to “iTunes Music Library” and did all the other steps as written above Oila! All the playlists are back and saved with cue times and all other info. Thank you, thank you, thank you! I got a new laptop and migrated everything from Windows Vista to Windows 7 (not without a lot of trouble). WHen I upgraded my iPad software tonight and sync’d my iTunes, it deleted all of the playlists. The system replaced the XML file, so I had to restore it from a back up. It worked like a charm!! Your tip saved me hours of aggravation! This doesn’t work for me :(:(:( I’ve tried twice, two different ways from the external hd I’m using to transfer data from old Vista laptop to new Windows 7 computer, and no dice! Its just doubling the generic playlists… Any other advice? Thanks for this post and thread. I have been wracking my brain to fix my playlists that went missing a few days ago thanks to an iTunes update. I could see the actual playlists as separate files but not remember/figure out how to import them to iTunes correctly. Hopefully this will work for me. I lost a couple hundred playlists in the update. I’m leaving the import to work its magic overnight. There’s about 1/2 tb of music and audio files to update all over again. I wish I’d known this trick before. I’ve manually re-created all of my playlists at least twice in the past from things like this happening. what I cant find are the folder playlist. I did follow the instructions , but they didnt appear, What can I do!? It worked! Luckily, I backed up my iTunes on my external hard drive. My problem is that the file iTunes Library does not contain all of my music. I recently burned a cd and that is all that is there. I used to have 3000+ songs in iTunes and they are gone. My folders only contain that one cd. I have NO idea what happened or how to fix it! Very disappointing, spent days creating my playlist! What a complete waste of time, get your crap together Apple this fix didn’t recover the playlists. Thank you for posting this! You saved my marriage. This did not fix my playlists – just duplicated empty versions of the generic playlists. I did notice before I tried to fix it, that one of my playlists (made my myself rather than the standard apple ones) had been duplicated but was empty. It was this extra copy that made me realise the rest of my playlists were nearly empty. They were ll there yesterday and I have only added 1 album since but about 6 albums are showing up (in total) in various playlists so I have no idea what is going on. Please say there is an actual fix that will get my playlists back! My computer recently crashed!!! Last time it did I was able to get all my music back no problem,but this time, I have absolutely nothing!!! Any possible way to get back the songs I payed for without paying another $50.00??? Didn’t work for me. Followed the steps very carefully and still, itunes did not “find” my “lost” playlists. Rebuilt them by hand. Great way to start the day. Thank you, thank you, thank you – and, did I say, thank you!!!! Retrieved 2500 songs and 34 playlists successfully – thank you!!! Hi, Just wondering how I reverse the playlist disappearing process, it didn’t work and I lost other playlists, thanks so much. Hey tried it and it didn’t recover the actual playlist on my iPod. My other play lists are there but this one playlist (which happened to be my best and biggest…grrrrr!) is gone. It only disappeared when I plugged it in to add more music. This solution seems to restore the itunes list but not the playlists physically on my iPod. Help!! Hi I was being clever and deleted my playlists from my iphone, when I plugged into itunes, ALL my playlists from my mac deleted. I have tried to restore the play lists like advised above, but it has not put any of the playlists into itunes and no music has gone into the folders. ~really annoying!! can anyone help. I have tried to put some playlists together manually, as I did this, I was thinking would this deter the restore and this is why its not working?? what can I do, I am djing in less than two days… HELPPPPPPPP?? Thanks – trying it now. Probably too late for me though… my library and playlists disappeared. Recovered the library and the playlists returned… with nothing in them. So I’m trying this out. We’ll see. This happened to me as a result of subscribing to I-Tunes Match, which I have to say does not work. Of the over 10,500 songs in my library it declared about 1,200 of them “ineligible” including recently uploaded songs from legally purchased CDs. It makes no sense. I was already seriously annoyed. Then this happened with my playlists and library. Yep. Didn’t work. Thanks though – at least now I’ll know what to do if it happens again. I tried to do this, but it didn’t work. Is there a way to undo what I did when I moved them to the desktop? My music files are scattered and would take forever to locate them all again! PLEASE HELP! Newest update (yesterday) lost about 2/3 of my playlists. The suggested solution did not work. Still most are gone. Very sad. I backed up my itunes library to my external hard drive yesterday and now my playlists have ‘gone’ (are still there but with no songs) this is on both my mac and ipod. I tried this method and it didnt work just duplicated the playlists empty. can anyone help me as I dont really want to remake my playlists again. My PC crashed and left me with the blue screen of death. Didn’t have iTunes backed up properly, couldn’t find the iTunes Library file… but when I did, this worked like the dickens. Really, a million thanks for your help. THANK YOU SO MUCH!! I transferred all our iTunes library to an external hard drive this morning and ‘lost’ all my playlists when I re-directed the library! This way of getting them back worked 100%. I was so worried but can now breathe a sigh of relief :) Thanks again! THANK YOU- I did an itunes update and everything was wiped out, I was near tears, but this was SO easy and worked perfectly!!! amazing!! I’ve clicked ‘File’ then ‘Library’ and there’s no import playlists option :S Please Help! I have all my iTunes (3600 songs and 15 playlists) on an external hard drive and want to keep it there. My laptop crashed and had to start from zero again. I downloaded iTunes and it was empty. I transferred my iTunes library to the laptop. 300 of my 3600 songas ar enow duplicated and I have lost all my playlists. What did i do wrong? I want to fix this even if I have to start over. If i confuse you try to follow the address below..
2:Make sure iTunes is closed – You can restart your computer if you paranoid like me..
3:Follow exactly as i say..
8:Now you should see a 3/4 folders and one iTunes icon that says (iTunes Library.itl) Now highlight that (.itl file) and click open.. 9:Presto!! Now iTunes opens with all your music and playlists. and those just showed up easily! although some of them (about 2-3 of my latest playlists) are still missing but it’s ok I still have them on my iPhone. I still have hope on the internet because of you, mate. Still works like a charm :) thanks for sharing this invaluable advice! Thanks so much! I have 2 ipods and thousands of song and personal recordings that you savedd!! You are the greatest human being on Earth!! Why can’t Apple post this?!! Thank you for saving our sanity. If Karma is real you should be set for life. Much love! Hey folks. Replaced the original hard drive on my Mac with a SSD. When I restored my iTunes library from the backup, my old playlists were gone. I tried the solution above, but it didn’t work. More precisely, iTunes looks different than in 2010 when the solution was originally posted. There is no longer an “iTunes Music Library.xml” file listed. Only an “iTunes Music” folder, which when clicked, opens to individual artists, which in turn opens to albums, which in turn opens to songs. There is also an “iTunes Library.itl” file (along with iTunes Library Extras.itdb and iTunes Library Genius.itdb). I tried the steps above using the iTunes Library.itl file rather than the .xml file, and also using an individual library backup file (the one listed just above). No luck. Is there a way to locate the iTunes Music Library.xml file in the new iTunes? It’s been a while since I lost the playlists but I’m still grieving. 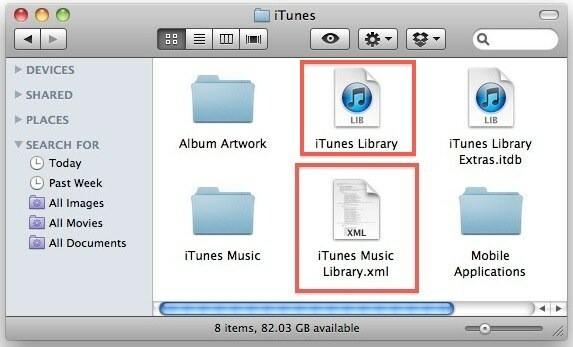 Why on earth would you remove the library files from the iTunes folder and place them on the desktop, then delete them? Then they are gone from the iTunes folder and quite simply deleted. I reread this, just to be sure. Sorry to sound like Columbo, but that just bothers me. Does he not mean “copy” the files from the iTunes folder and place the “copied” files onto the desktop – then the original files are still stored inside the iTunes folder, just in case something goes wrong. No. The whole point of this is to move the configuration file outside (XML) of iTunes so that iTunes has to create a new one. You are putting in on the desktop and NOT deleting it so that you can restore it to iTunes in case it does not work as expected (by putting it back inside the iTunes folder). It is a simple troubleshooting technique that can work with many applications too, even things like wi-fi configuration. I’d love for this to work just now on Sierra, but I find neither of the files mentioned in the iTunes folder. That’s a shame. Life saver…thank you sooooo much!